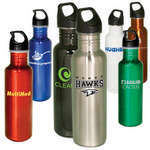 Personalized aluminum and stainless steel water bottles make great corporate gifts to employees. 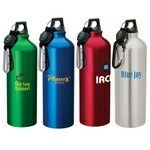 Customize with your company logo and choose from several unique colors. 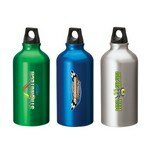 Our selection of metal sports bottles include bike bottles and tumblers with different lid configurations. 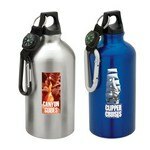 Our stainless steel and aluminum water bottles are BPA-free and safe. 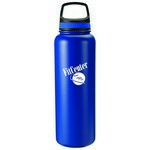 The Stratford 17oz Pop-Top Vacuum Insulated Stainless Steel Bottle features dual wall insulation and allows inserting brand logo and message to make impressive Company Logo Products. 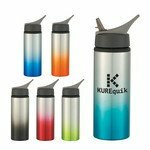 Elegantly designed with a streamlined body, this stainless steel bottle combines efficiency, utility and good appearance with functionality. 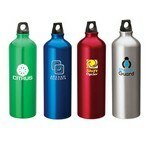 Imprinting your company’s personal logo, adds a touch of class and high brand recall. The twist-top handle keeps up with your fast-paced lifestyle. Features Web Strap with Compass. Using the elegant 16 oz. 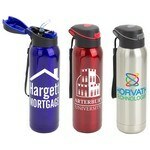 Stainless Steel Milan Tumbler to promote your brand and leave a long lasting impression of your company in the minds and hearts of your customers. The 25 oz. 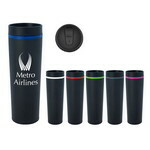 Aluminum Ozona Tumbler is a sleek and elegant tumbler that will add a touch of class to your brand promotion campaigns. This promotional Aura 20 oz. Vacuum Tumbler features a non-slip band.